Actually grips his putter like a hockey stick trying to be like his golf hero, Happy Gilmore. There is no doubt this kid crushes it in the weight room, as we’ve seen him do feats no one even thinks of. Strangely, he only eats burgers. Sometimes on the golf course Henry will be seen lasering deer with his rangefinder instead of the pin as his southern instincts take over. Has occasional outbursts where he yells in Spanish, whether it be at his golf ball or himself. David is a walking encyclopedia, with an amazing ability to spit out facts on everything. Is often found jamming his Friday nights away on the piano, singing with his friends. He has been to every single restaurant in Palo Alto so if you ever need a restaurant recommendation, he’s your guy. Franklin, nicknamed “Tank” and “Meh” (his favorite phrase and response to everything), likes to keep things simple. Whether it be his golf game or life in general, he is running complex equations and programs in his head computing how to do each task with the least amount of energy. LOVES the versa climber, and you can read about his experiences with that in his blog. Brad is a human Shazam when it comes to country music. Perhaps spends more time during workouts staring into the mirror than actually lifting weights, which is fine for him because he already hits it a country mile. Has unbelievable recall of rounds he’s had for he can tell you any shot he’s hit in the last decade, including all 10 on hole 18 at the Prestige his freshman year. Has a fiery passion for hula dancing, as seen here when he performed in front of the tournament in Hawaii this year. “Practice makes perfect” does not apply to his ping pong game as the more he plays, the worse he gets. He has since retired from the sport, which has helped lower his blood pressure levels tremendously, as well as saved the lives of many ping pong paddles. 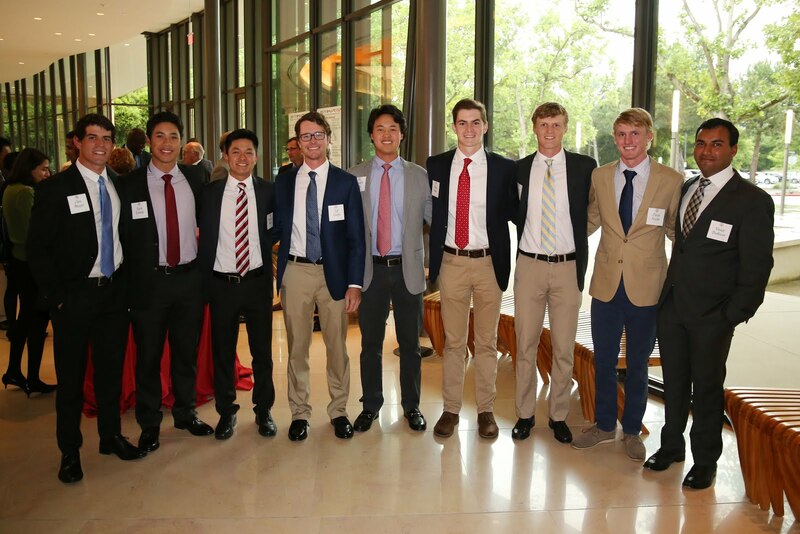 Meyers’ life revolves around sports for not only is he a crucial member of the golf team, but also a fierce supporter of Stanford’s women’s tennis and soccer teams. Has never shot over par on a desert golf course, perhaps due to his upbringing in Tucson. Is also the only person to ever double eagle 18 at Pebble Beach, capping a walk off win in the Nature Valley First Tee Open, an incredible feat. Ashwin, nicknamed “The Truth” by Coach Ray, loves to watch Tiger swing videos on youtube. You may see some similarities in their swings, however, only if you look really closely. Does his homework in record pace, perhaps due to his knack for starting an hour before its due. (Written by Isaiah) Aside from golf, Brandon “caveman” Wu has the rare ability to watch TV shows at an incredibly fast rate. This Netflix conciser once finished the entire Game of Thrones series is less than a week. Aside from TV, he spends a lot of time in the Product Realization Lab, or PRL for short. It is not as cool as it sounds. In the spirit of the new year, I thought it would be fun to generate a few “Top 10” and “Top 5” lists. From my top golf courses to my favorite LP’s, the lists will provide some insight into the life of a student-athlete at Stanford University in 2018 and a little about the things I enjoy. Is it just me or are restaurants hard to rank in a specific order? I struggled because as I wrote this, a plate of Texas BBQ sounded particularly good! If you’re visiting Palo Alto, you shouldn’t be led astray if you go to any of the places on this list (they also won’t take any nasty bites out of your wallet). I also avoided including any chain restaurants. I mainly considered the quality of the food at each restaurant, but I also considered the atmosphere and ambiance. 1. Pressed Juicery - the frozen juice is just like the texture of frozen yogurt and even better! I’ll change the pace here a little and talk about some 33’s. I’ve always loved music and sharing music with people, after all, that’s how I’ve been introduced to my favorite stuff. Since last year, I’ve been getting into vinyl records and many people have helped my collection grow. Here are my favorites so far. I considered the entire collection of songs as opposed to just the hits when ranking these records. Of course the epic album artwork of Stairway to Heaven and Days of Future Passed carried some weight! 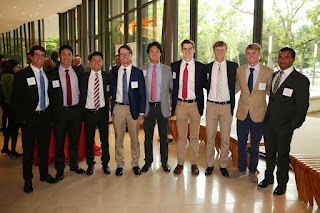 As much as I wish I could play golf, listen to music, and eat all day, I must admit I am also a student at Stanford. So, I’d like to share where most of the magic happens. Stanford’s campus is massive and there are literally thousands of places to sit down and do work, but only a small few are practical on a day to day basis and only a couple are worth going out of the way to get work done. 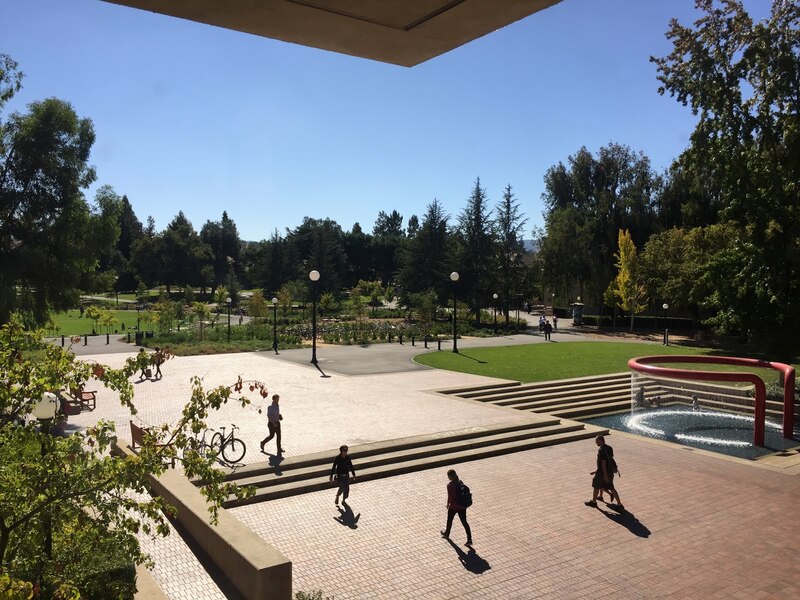 The single most important thing I do here at Stanford is take classes (I had to say this in case my dad sees this blog). I’ve tried my best to select classes that I will personally value and ones that will advance my pre-law track. Although pre-law is not a specific track like Pre Med, it is important to take classes that are rigorous and prepare students for the kind of writing and research work of Law School. For ranking my classes, I considered everything from quality of the professor (a very important metric) to the amount I enjoyed the work content of the course. Since Stanford is in Silicon Valley, I might be in trouble if I didn’t have a list of something pertaining to tech. In the year and a half I’ve been at Stanford I’ve been introduced to many new helpful smartphone applications that make things easier. To rank these apps I thought about which ones I couldn’t live without...so there is no list….just kidding. Although I could live without all of these apps, they help my efficiency. If you haven’t heard of any of these apps I highly recommend looking them up and seeing of you could benefit from using them in some way - I know I have! Stanford, the places our team travels, and the Bay Area in general are full of places to snap great photos. 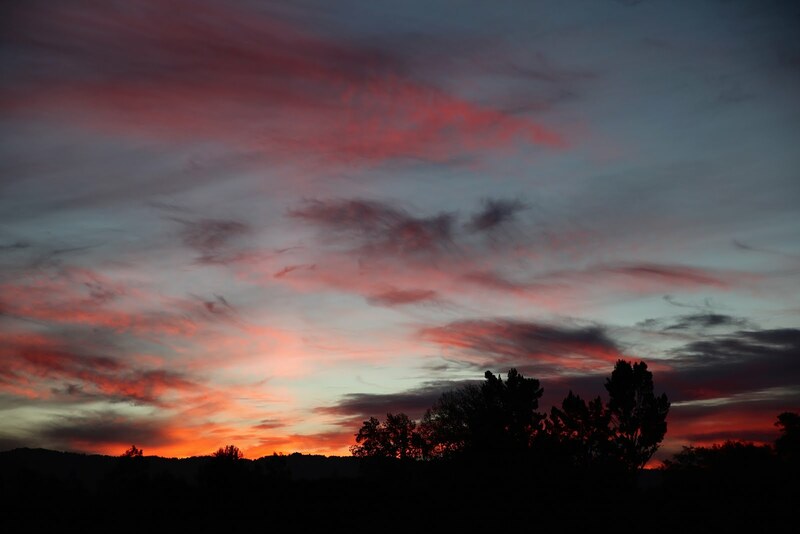 I hope to convey some of what is fun and beautiful about life at Stanford. The particular order of the following photos is not as significant as the previous rankings. - My teammates might laugh if they see that I chose a sunset photo as the first one on the list, but it’s true, I do love sunsets. I took this photo after a long practice at our awesome practice facility on campus called the Siebel. One of the best views on the property is looking over the hills as the sun falls through the clouds. - One of the perks of having a brilliant group of students around you on campus is that many of them play instruments really really well. 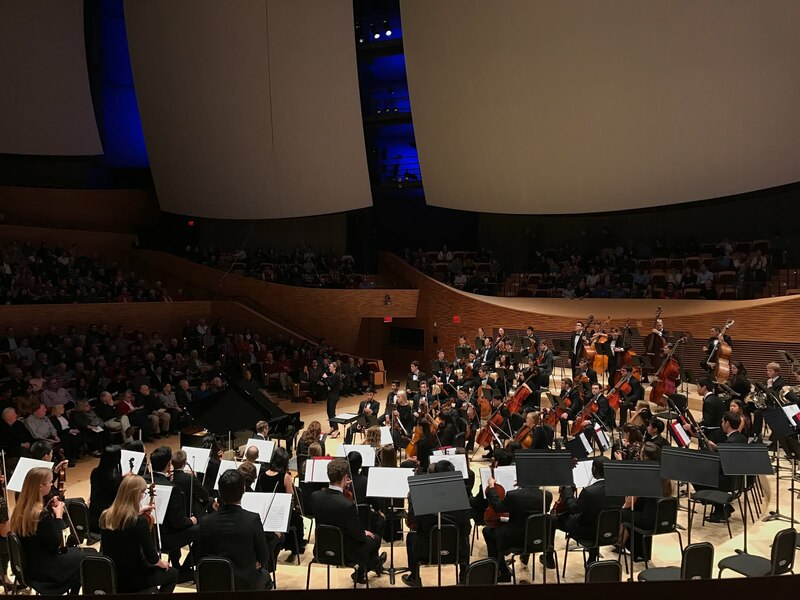 This is a photo of our Stanford Symphony Orchestra as they prepare to start a piece by Pyotr Ilyich Tchaikovsky: Symphony no. 5 in E minor. - This is Arastradero Biking trail just 10 minutes drive up the road from campus. It’s a relatively tame trail and a wonderful workout for a sunny day. 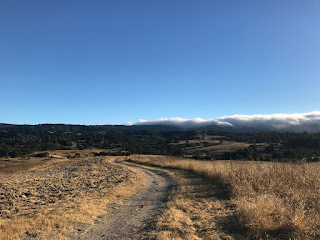 When my sister was a visiting student at Stanford over the summer, we biked this trail multiple times. 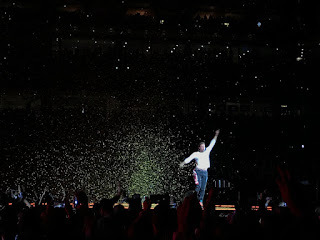 - This is Chris Martin, the lead singer of Coldplay, in the middle of singing of their hit song, Hymn for the Weekend. 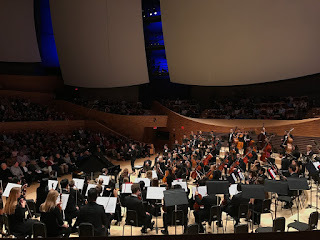 During fall quarter, I went to this concert with my old teammate Viraat Badhwar who graduated in 2017. The Bay Area is host to concerts by the best musicians in the world so I always keep a lookout for tours. Next up is Justin Timberlake in April - I hope I can find a way to make it to that one! - Some may not be able to pinpoint exactly where this is on campus because this area is usually completely dry. Last winter we had so much rain that Lake Lag actually filled up completely. The lake was directly behind my freshman dorm, Roble Hall, and was a beautiful place to sit on bench during the months it was full. 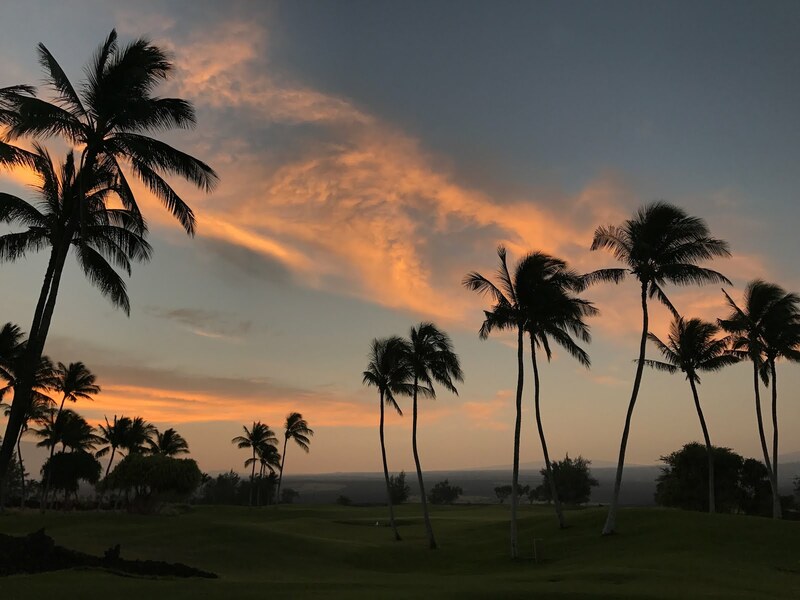 - Although we do have plenty of palm trees at Stanford, these particular ones find their home on the Big Island in Hawaii where I played my first college tournament, the Amer Ari Invitational. As usual, the weather was fantastic that week and the team camaraderie was a blast. 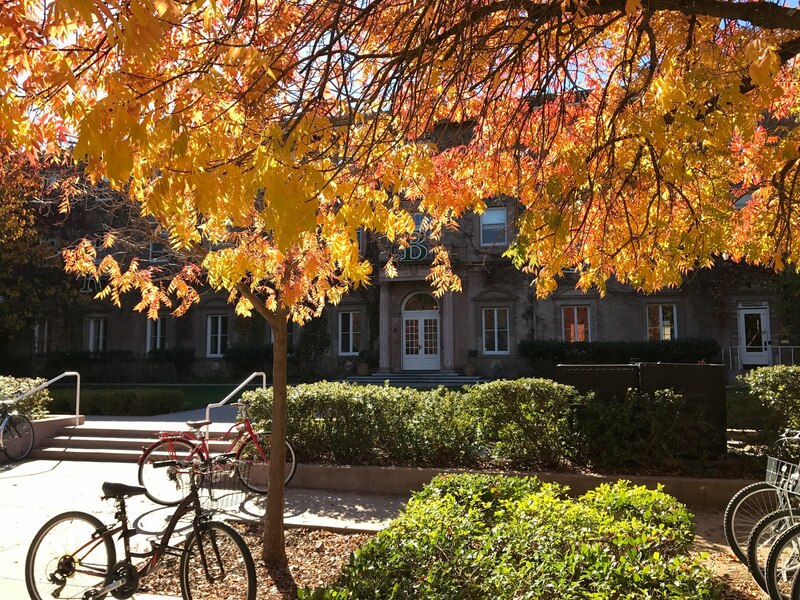 - Fall does actually exist at sunny Stanford! 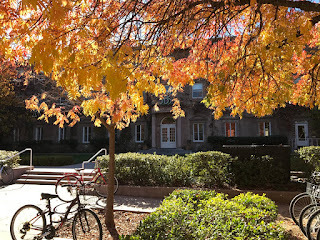 This is a view of Roble Hall last year as the sun hit the colorful leaves of the trees out front. Bikes are seen everywhere on campus, as they are the primary mode of transportation for students. - One of the most beautiful spots on campus is Meyer Green and the fountain right next to it. If it’s a sunny day and the weekend, you’ll often see young kids playing in the fountain (as a couple are in the photo). 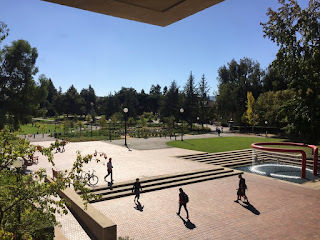 I took this photo from inside Green Library where I study on occasion. During finals week, the whole entire paved area you see in this photo is covered with bikes due to all the students who are hunkering down in the library. - I thought I’d wrap up this blog post with a photo of the Pacific Ocean from the par 3 course called the Cliffs at Olympic Club. We practiced here for an afternoon last year in preparation for our tournament in Hawaii. 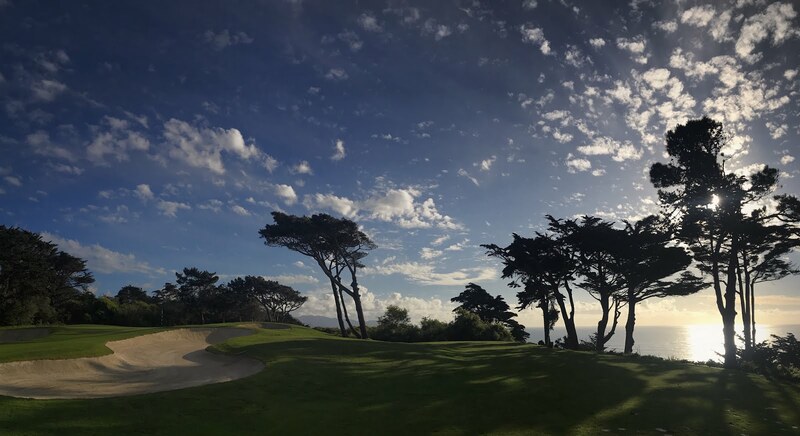 There are few experiences better than playing at Olympic Club, on a warm sunny day, with your teammates who are all playing well and excited for a trip to Hawaii. That’s it for now! Until next time, GO CARD! I should probably start with a little bit about myself. I’m a perfectionist. I like to have control. I like to plan. Everything I did in regard to golf in the past year was focused on the goal of contributing to the team when I arrived on campus. I planned my entire 2017 schedule so that I would be peaking in September, and I was. Then I injured my calf three days before the team reported for preseason practices, and my entire plan was thrown out the window. I wasn’t really sure what I wanted to write about for this post, so I started with the best source of inspiration I could think of, The Truth. I read Ashwin’s recent blog post (it’s a must read by the way), and realized that despite being in the same position as incoming freshmen, we had significantly different first quarters. While the team was competing against Army in the Bush Cup, I was back on campus with our team trainer getting treatment on my calf. Instead of lifting during workouts, I was doing physical therapy exercises. During practices and qualifying, I was sitting on the metaphorical sideline that doesn’t exist in golf. I’ll be honest, it was frustrating. I was around the team, but my physical limitations made it difficult to feel like I was contributing, and it weighed on me mentally. So, I trusted the process. I couldn’t control the fact that I was unable to play golf, but I could control how I reacted to a difficult situation. I did everything I could from a rehabilitation perspective so that I could be back playing as soon as possible, and I tried to focus on the positives. I had great teammates, great coaches, and the Eagles were winning (and still are. Nick Foles is taking us to the Super Bowl. Don’t @ me.). I realized that I wasn’t going to have the fall season I had envisioned for the past two years since I committed to Stanford, but that didn’t have to be a bad thing. If anything, it made me appreciate Stanford even more. For starters, the weather is absolutely unreal. From when I arrived on campus to winter break, it rained once. Yes, once. I don’t think I checked the weather past the middle of September once I realized it was going to be somewhere from 65 to 75 degrees and sunny every day. That’s not exactly what I’m used to coming from Pennsylvania. Like I said, pretty special. I’ve learned that every student at Stanford has a reason why they are here, because they are capable of doing great things. I really feel like that’s true of our team this year. Some have written us off after graduating two incredible seniors in Viraat and Mav, but having been on the sideline, I’ve seen how hard our guys have been working, and I think we’re poised to have a special spring season. As for me, my calf is starting to feel better, and hopefully I’ll be back playing soon. Until then, I guess I’ll just have to keep trusting the process.